Let me start out by saying the critical period for socializing any dog ends at 16 weeks of age. What happens to the puppy before that age will have more impact on the adult dog he becomes, than anything that happens later. So if a breeder keeps the puppies kenneled outside during that time, rather than raising them in the home and taking them out for various socializing and training opportunities, the puppies may never be able to reach their full potential. I can't stress this enough. It is critical that a puppy in a home with his new owner, and any puppy still with his breeder, is properly and extensively socialized to all sorts of people including children, to other pets, and to many different situations he will encounter in a normal life with humans! There are many, many articles and studies that have been done in this topic, so if you want to read more, you can do a search on the web for phrases like "critical period for socialization in canines". Even after 16 weeks of age, it is still very important to consider a well thought out socialization plan. What is socialization? You hear that term tossed around a lot, but what does it really mean? Socialization doesn't just mean taking your dog in public, or exposing him to a certain number or type of people. It means getting him used to all sorts of handling such as having his feet, mouth and ears touched, being restrained for grooming or medical treatment and many other things. It means getting him exposed to a huge variety of situations, noises, people and other animals, and many other things, so he will be well rounded and confident in his life. This means household noises like a vacuum cleaner, the TV or radio, noisy kids playing, and so on. I try to make sure my dogs meet at least a dozen new people a week during the first year of life. I want to get them around tall people, short people, men with beards, people in hats or shiny sunglasses, people who smoke (we don't), loud people, quiet people, people of different races, people in "funny" clothes, kids, older folks and so on. I also try to get them around different dog breeds and other animals, around busy traffic areas, in other buildings and homes. I groom them regularly and make handling for medical treatment part of our regular social time. By that I mean I may practice holding them in various ways such as they may need to have blood drawn and so on. That way when it's time to actually have treatment at the vet, they are more used to it. 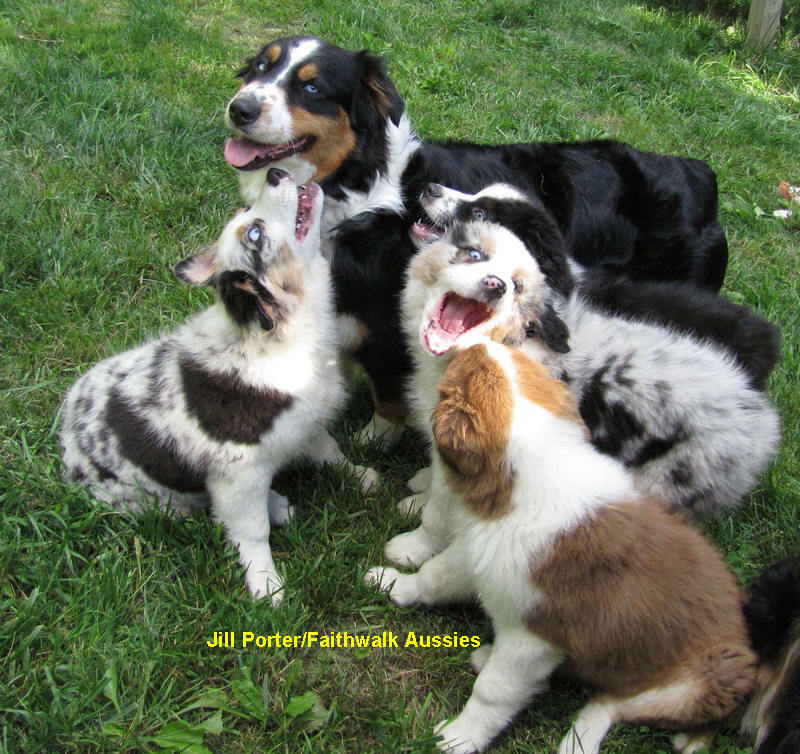 Australian Shepherd pups need plenty of sensible, controlled socializing from birth on, if they are to reach their full potential. As a breed, as per the standard, they may be reserved with strangers and possess strong guardian instincts (see both the ASCA and AKC breed standard, the section on character.) What does this mean to a pet owner? If not well bred, raised and socialized, you may have a dog who is overly protective of it's home and family, or overly fearful. This takes a lot of the fun out of owning a dog, not to mention is a major liability. 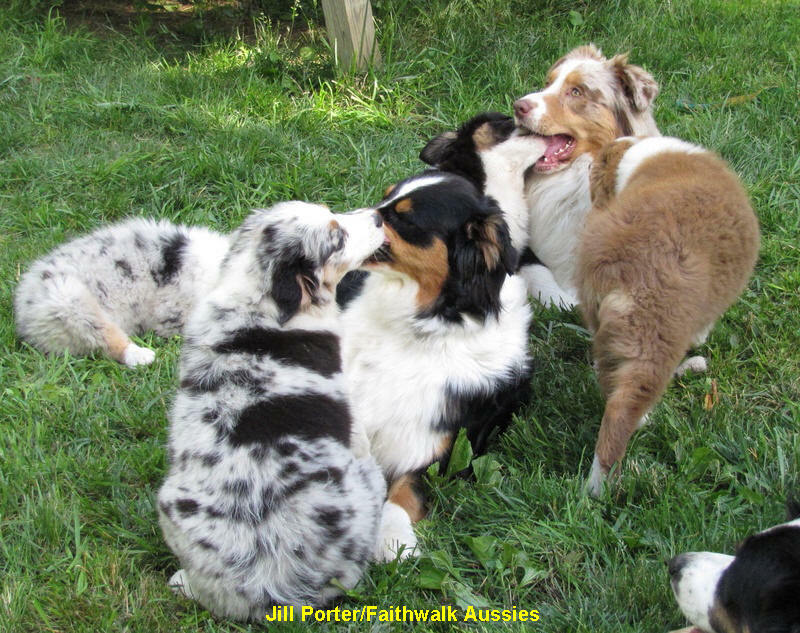 Even well raised and socialized Aussies may possess some of these qualities, but the purpose of this article is to help an owner minimize that to the point the dog is a joy to live with. Socializing should start before your puppy comes home. A good breeder will be hands on with the pups from birth to the point the pup is transfered to it's new home. Ideally that would mean the pups are born inside and handled daily, and exposed to all sorts of sights, sounds, smells and experiences. I am doing Early Neurological Stimulation, from days 3-16, and I handle them daily in other ways as well. When they are mobile, they will meet visitors and other "puppy safe" dogs and even other animals. You have to use caution in taking a young (and unvaccinated) pup out into the big world, but you can safely do it to some extent. I wait until my pup has his first shot, and then start taking him for truck rides, and visits to the local stores which allow pets to visit. I don't put pups on the floor or let them come in contact with other pets in the store, at this stage. Same for vet visits, they are carried in to avoid being on the floor or ground, until they have completed their shots. In the mean time, I take them places where the risk of coming in contact with other potentially disease carrying dogs is low, but where they can meet people and see other sights and sounds. If you have other puppy friendly, healthy dogs in your family, neighborhood, or circle of friends, the puppy can be introduced to them after at least the first, if not second shot. The most critical time to expose your puppy to as much as possible, but in a safe, controlled way, is 8-16 wks. I can't stress this enough, as this is what will determine a large part of how your puppy will turn out! Another concept with socializing I want to discuss is HOW to do it. Many people almost force their pup to meet new people, even when the experience is clearly overwhelming for the pup. I try to keep a close tab on how my pup is feeling. I let them have some say in how much contact they have with new things, at first. I think it builds confidence for them to decide how to relate to things, and I set them up to succeed by trying not to put them in situations they aren't ready to experience, but I reward them (often with food) for exploring and visiting. Once they've had their shots, I may take them in the local big farm store. The employees generously hand out treats and it encourages dogs to want to go up to greet new people. I don't force them to accept petting if they aren't comfortable, but let them set the pace. Most of the time it's more about holding them back though, as they want to see people to get treats. The reason I use caution and not force them is I have seen a number of dogs really damaged by that, by being flooded with more than they can handle. You have to have a balance of positive experiences at this stage, to get an ideal outcome. Your puppy needs to trust that you will not put him in a situation that is too much for him to handle. If you damage that trust by forcing him at a young age, you may never fully get it back. IMPORTANT: Something you don't want to do is reward fear or caution by cooing to the dog, trying to reassure it with soothing words or petting. That simply reinforces their fear or uncertainty. 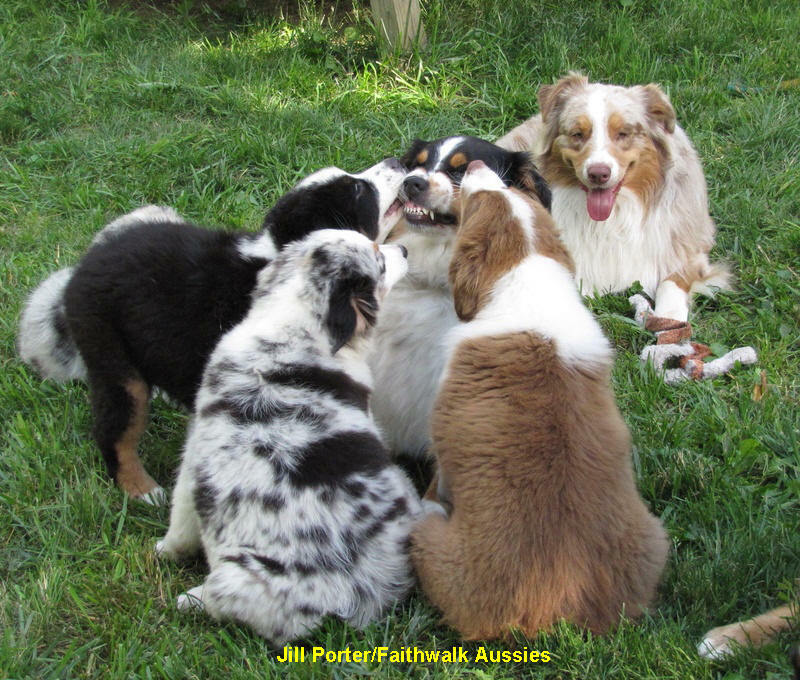 Many dogs, Aussies included, may go through fear periods as they grow, meaning your normally outgoing puppy suddenly acts afraid of a new person or situation, or even things it used to be fine with. A lot of people try to comfort the dog, but that simply reinforces the emotion and behavior. What I tend to do is pretend to ignore their fear, as if I am saying "I don't have a clue why you are acting like that, you silly thing, there's nothing to be afraid of." It's sort of like being matter of fact rather than feeding the fear. I guess it's like if you have a toddler who is running across the floor and falls. You can gasp in horror in which case the child will probably start crying, or you can laugh, in which case the child will also laugh. Just like that child, your dog will feed off your reactions more than you will ever know. If I have a dog going through a fear period, I keep taking them everywhere and have people feed treats. I don't happy talk the dog, or do anything that may make them them I approve of them showing any hesitation, but I sometimes look straight ahead at whatever we are doing, expecting the dog to come right along, as if it never occured to me they may even consider being afraid. I may see them out of the corner of my eye, but I don't watch them with my full gaze. It's like again I am telling them I don't expect or anticipate them being afraid and that travels down the leash in a big way. I just don't feed or reward fear, but will set things up for the dogs to succeed. I may walk them around people and carry on a conversation with the person, almost ignoring the dog, and the dog just picks up that it's no big deal to be near strangers. If I approach a stranger anticipating the dog being afraid, they will be if they weren't inclined to be in the first place. Aussies are so keen at sensing our emotions and reacting based on that. I have used these methods with foster dogs with great success. Of course, if you can enroll your puppy in a reward based, quality training class, that is great. I highly recommend it! In some places those types of classes are easy to find, in others they are harder. Find a trainer who is familiar with the breed and comfortable in working with them. Watch a class before enrolling, if you can. If at any point you feel uncomfortable with the methods used, don't take your pup there. Even if you have already started a program, the same applies. Never let a trainer do something to your dog, or instruct you to, that makes the dog afraid of you or other people, or damages the trust and confidence you are building. Another comment I have is if you start to see your puppy bark at people or things, try not to make too much of a fuss over it, in a good way or bad way. Your dog will naturally protect you, you don't need to encourage it in a young pup, nor do you want to correct them for that as it could be motivated by some uncertainty, and you don't punish that. If your pup starts to huff (that breathy kind of bark, usually indicating fear or uncertainty), try to change the subject by walking it off in a different direction. Next, plan ways to make the next similar encounter set up in a way to encourage your pup to react differently. If he was barking at a person, set up a friend to come in from a distance, tossing treats to the pup, and maybe saying a mild greeting but not being too loud or excited sounding. You want the pup to see the approach of a stranger as not a huge deal. If you tense up and anticpate a bad reaction from your pup, you will get one. If you set up the training to make it possible for your pup to succeed, and picture succeeding, you will. The other thing you must do is understand the concept of management. Even a "good" Aussie may find situations or people he or she just doesn't like. Rather than trying to force the dog to behave in such a situation, don't be afraid to simply remove the dog. An example could be a rousing game of touch football in the yard. If your Aussie wants to "help" you or "protect" you from your friends, or your children from their friends, it's better to just remove them rather than have the dog take matters into his own paws. You can keep working with the dog in that type of situation, but some may just find it too stimulating given their herding instincts. It's better to remove the dog than have it bite! In an Aussie, chasing moving objects is a very self rewarding behavior (meaning it feels good so it doesn't need an outside reward like praise or treats.) The more they practice it, the more they will do it. So the best thing to do is to remove the dog until you can train to have more control over the dog, and the dog can learn more self control in that situation. If it can't learn that control, just don't have the dog loose in those situations. It may be asking more than the dog can give. I also recommend you read this article by Turid Rugaas, on calming signals. Learning to understand your dog's cues can help you assess how he feels about a given situation. You can then learn when to proceed and when to back off in training or exposing him to new things. This is VERY good information and I highly recommend you read it. One really important concept I want everyone to understand is a dog is not a human nor should he be treated like one. Also, just like some humans don't like EVERY person or situation he finds himself in, neither do dogs. So bear this in mind and realize your dog is a thinking, feeling creature who may just need some understanding in some situations. Dogs never do things without a reason or without warning, but if their owners don't understand them they may be blamed for that. It is the human who lacked the training or skill in observing and understanding. Most dogs want to please as it gives them the positive feedback from their owners, but not all dogs will be "perfect" in all situations. Love your dog anyway, and train him, don't blame him! I wanted to add some information for people to use to help them properly meet a new dog. This will apply to Aussies as well as any dog. You can use this info to coach people meeting your dog as you have him out to socialize. It is even more important to teach children how to properly meet and greet dogs. So many people see a pretty dog and want to rush up to it, speaking in a high pitched or loud voice, and either pet or hug the dog. If you think about how the dog perceives this, you may realize this is not the right way to approach. Many dogs are threatened by a strange person rushing up to touch the dog, especially if the person is being loud and looming over the dog, or is trying to touch it. Instead, remain calm and let the dog approach you. Don't even try to make physical contact, and don't talk to the dog. Instead, let the dog smell you and make the first contact. After the dog has done this, you may put your hand out to be sniffed. If the dog seems comfortable and accepting, reach under it's jaw line to give a scratch. So many people reach over the head of a dog, which is another potentially threatening gesture. Also, dogs don't instinctively enjoy being patted on the head. (Do it to yourself and see if you find it pleasurable). The same goes for patting their ribs, something I see some men do at times, giving a hard couple thumps on the dog's side. Instead, try scratching under the chin, on the chest or on the rump above the tail. These are places most dogs enjoy being petted. Unless you know the dog well don't try to hug the dog. Know that hugging is something people like to do, but dogs don't naturally understand it as a sign of affection. 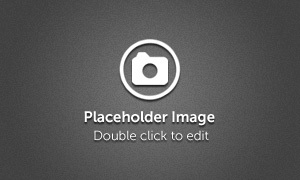 In fact, in dogs, it is more likely to be used in a dominance interaction, where a dog may wrap it's paws around the neck and shoulders of another dog in an attempt to dominate it. It is especially risky for a child to try to hug a strange dog, as the dog may bite. Though people think it's wrong for a dog to bite in that situation, it is a perfectly natural reaction for the dog. By behaving in this manner around new dogs, you will find most react much better to you than they would if you played the obnoxious animal lover. And, you will be keeping yourself safe from a potential bite for doing something a dog is not comfortable with. Something else that I consider VERY important in raising balanced dogs is that puppies get plenty of time with adults that have stable temperaments. At my house, my adult dogs are very appropriate with puppies and my puppies get many hours a day with them every day. I am careful at first when puppies are young, that they don't get trampled when the big dogs play hard, but after that they are together almost all waking hours. As you can see in the pictures below, the puppies instinctively submit to the adults and since my dogs have stable temperaments, they put up with the obnoxious puppies quite well. The adult tri female is showing her teeth in a warning, but that is all the further she takes it. If they persist she may get up and move, but doesn't use a lot of force even with slightly older pups such as these. The puppies get to practice submission and if they push TOO hard, the adult may give a quick correction. In the last of the three photos, one puppy is putting his muzzle in the mouth of his father. That is a mix of submission and food begging behavior. Going back to wolves, puppies lick and nibble the corners of the mouths of adults, to stimulate them to regurgitate food. 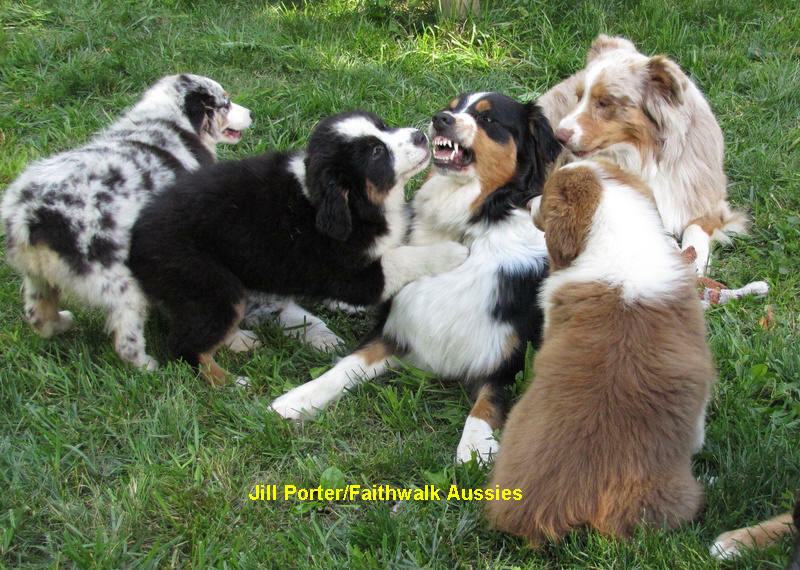 My Aussies seldom do this but I have had some of the northern breed dogs I have feed puppies this way, and have seen it happen countless times with wolves. It's all normal and common canine behavior and it is instinctive in puppies. I have occasionally gotten a puppy that didn't get enough or any time with other adult dogs and the difference in their social skills is quite easy to see. Puppies raised with other dogs learn so much, but of course these must be dogs with the appropriate social skills themselves, or they may hurt the puppies. I also feel that by only breeding dogs who CAN be good with puppies, we increase the chance of producing puppies who can inherit the ability to develop good social skills. It takes both to raise stable dogs, good genes and proper upbringing. In these photos above, you see normal and natural interactions between stable adult dogs and puppies that are around 3 months in age. The adults are intact dogs, the black tri is the alpha female of the dog family, and the male is second ranking and sire to a couple of the pups. I would never breed dogs who are not good with puppies as all parts of temperament are a mix of inherited and learned, and if their genetic temperament is not stable, they are not likely to produce puppies who can have stable temperaments. In the top two photos, puppies submit to the adult female, and in the third photo down one is submitting and food begging from the male, and in the last photo the female shows what almost appears to be an expression of "the things I have to put up with!" She doesn't harm or over correct the eager puppies, but gets up and moves away if they pester too much at this age. Later, a stable adult may start to correct older pushy puppies. That doesn't mean causing harm, but mildly correcting and teaching the puppies some boundaries. To wrap this up, when you take on an Aussie puppy or adult, you are embarking on what should be a very rewarding partnership with an amazing breed of dog. It's up to you to set the stage for success for your little canine genuis! Help him be all he can be! Train, socialize and succeed! This is a GREAT article about temperament and how it works. It is about German Shepherd Dogs but the principles apply to all dogs, and since Aussies are also herding dogs, it's even more close for them. I really encourage anyone wanting to understand temperament and why it is genetic, not "how they are raised" to ready this.